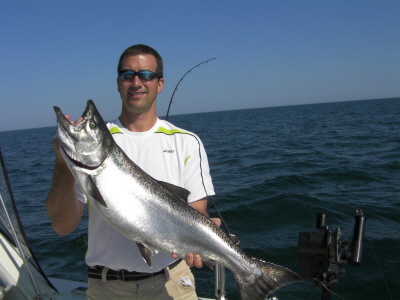 Specialize your tackle for fishing in Milwaukee! Grand slam is a normal catch with all species available. You must fish top to bottom to put numbers in the box. Most normal years pounding the big Chinooks was the way to go but to this point fishing has been far from normal. Coho action has slowed but hard work on the water will produce. Everyone likes big fish and Clayton Robinson after a long battle boated this 19 pound 2 ounce Chinook. Magnum spoons are a good bet for the big fish. Surface water has warmed to 68 degrees and most of the action is 15 to the bottom. To get my fish reports and how to videos first go to http://www.jimhirt.com By subscribing you will keep ahead of the other anglers. When I post you will get it fast! Top to bottom presentation is answer with fish scattered and a lot of good water available. I run a mix of all size spoons on boards, divers and downriggers. Throw in a flasher fly and keep moving till you find action. On the high board lines regular Vulcan spoons in silver, silver blue and silver green is the best for Brown Trout. Coho will hit all size spoons from 30 to 55 down off downriggers fifty to one hundred feet behind the ball. Some Rainbows hitting at the same depth or a little higher. When you can find them the Reaper Magnum Big Joe on a SWR has been the best for Chinooks. Looking for Reapers and Vulcans made by http://www.badgertackle.com you may only order them online. Try them their shipping is cheap and they arrive fast. It hasn’t been a easy bite but changing presentations and depths will offer rewards. 225 copper behind a Church Walleye Board is one of our best presentations. Three, six, eight and ten color leadcores are also working. Wire divers have replaced the braid divers set to #2 with 120-150 feet if line out. Silver spoons have taken Rainbows to twelve pounds the last several days. A little faster speed about 2.5 is required for Rainbows. I use the Depth Raider to measure speed at the ball. The boat speed of 1.9 to 2.2 has been best. Don’t forget the Lake Trout near the bottom magnum Reaper glow spoons SLOW, SLOW, SLOW 1.5 or less will net Poor Mans Lobster. Currents are crazy out there if your not catching fish change directions and speed. Fish east of Milwaukee 65 to 120 feet of water. Head out the Main gap Milwaukee north or south there is no hot spot for the best action. Have a great fishing season. Let’s go fishing! Jim charters out of Milwaukee, WI. with Blue Max Charters. He can be reached at 414-828-1094 or visit his web site at http://www.bluemaxcharters.com Copyright© 2011, James J. Hirt, All Rights Reserved. Consistent and productive fishing in Milwaukee! Coho are the majority of the catch with some Chinook salmon to 19 pounds like this 16 pound 12 ounce King caught by Bill Smith. Bill caught his trophy on a Reaper Magnum Peacock spoon. Surface water has warmed to 65 degrees and most of the action is 45 to 65 down in the 48 degree water. Magnum spoons are working on the leadcores. To get my fish reports and how to videos first go to http://www.jimhirt.com By subscribing you will keep ahead of the other anglers. When I post you will get it fast! With the warmer water the most aggressive Coho and Chinooks are coming on magnum spoons. Reapers and Vulcans made by http://www.badgertackle.com have been working for us. The Magnum Reaper Fish n Chip is the hot bait for the bright blue sky condition we have had the last five days. I have been running this spoon on all twelve of my lines and getting action all day long. 150 copper behind a Church Walleye Board is one of our best presentations. Six, eight and ten color leadcores are also working. Coho are from 25 feet to 50 down on downriggers as well. Chinooks are in pockets of colder 46-48 degree water. Wire divers have replaced the braid divers set to #2 with 60 to 120 feet if line out. The surface is almost sixty degrees and it is time to work the Rainbow Trout in the top twenty feet. Two and Three color leadcore with the Regular Vulcan Dolphin Green and Silver has taken Rainbows to twelve pounds the last several days. A little faster speed about 2.5 is required for Rainbows. I use the Depth Raider to measure speed at the ball. The boat speed of 1.9 to 2.2 has been best. Fish east of Milwaukee 45 to 130 feet of water. Head out the Main gap Milwaukee 65 degrees. Fish northeast in White Fish Bay for the best action. Have a great fishing season. Let’s go fishing! Jim charters out of Milwaukee, WI. with Blue Max Charters. He can be reached at 414-828-1094 or visit his web site at http://www.bluemaxcharters.com Copyright© 2011, James J. Hirt, All Rights Reserved. 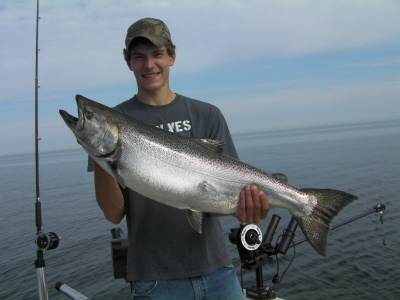 Milwaukee Salmon Fishing Heats Up! Coho, Chinooks and Rainbow make up the majority of the catch with an occasional Lake Trout. Surface water has warmed to 58 degrees and most of the action is 25 to 50 down in the 48 degree water. Spoons are now more important than ever to improving your catch. They should be your go to bait as the water approaches the most active range of your favorite species. To get my fish reports and how to videos first go to http://www.jimhirt.com By subscribing you will keep ahead of the other anglers. When I post you will get it fast! With the warmer water the most aggressive Coho and Chinooks are coming on magnum spoons. Reapers and Vulcans made by http://www.badgertackle.com have been working for us. The Magnum Reaper Fish n Chip is the hot bait for the bright blue sky condition we have had the last two days. I have been running this spoon on all twelve of my lines and getting action all day long. 150 copper behind a Church Walleye Board is one of our best presentations. Six, eight and ten color leadcores are also working. Coho are from 25 feet to 50 down on downriggers as well. Chinooks are in pockets of colder 46-48 degree water. Wire divers have replaced the braid divers set to #2 with 60 to 120 feet if line out. The surface is almost sixty degrees and it is time to work the Rainbow Trout in the top twenty feet. Two and Three color leadcore with the Regular Vulcan Dolphin Green and Silver has taken Rainbows to twelve pounds the last several days. A little faster speed about 2.5 is required for Rainbows. I use the Depth Raider to measure speed at the ball. The big Chinook are hitting on Reaper Magnum Glow spoons. The boat speed of 1.9 to 2.2 has been best. Fish east of Milwaukee 45 to 200 feet of water. Head out the Main gap Milwaukee 65 degrees. Fish northeast in White Fish Bay for the best action. Have a great fishing season. Let’s go fishing! Jim charters out of Milwaukee, WI. with Blue Max Charters. He can be reached at 414-828-1094 or visit his web site at http://www.bluemaxcharters.com Copyright© 2011, James J. Hirt, All Rights Reserved.